Pleasant Times Industries is a World renowned name in making exclusive and exquisite classic wooden games such as Chess pieces, inlaid chess boards, inlaid backgammon, cribbage boards, dominoes, dice, poker chips cases, racks, playing card boxes, etc. in various fine quality wood such as Rosewood, ebony, white maple, teak, boxwood etc. Our company has been in this business since 1982 and have made a niche in fine wooden games sector, winning acclaim from everyone for quality and craftsman ship. 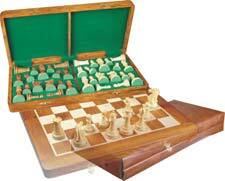 Our craftsmen have inherited the skills from their ancestors and that is the reason for superb quality and even entered the Guinness Book of World Records by making the smallest complete chess set/board in wood. 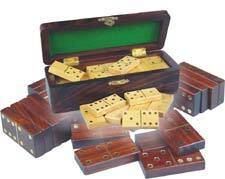 Wooden Dominoes Tiles available in Ebony, Rosewood, White Maple & Golden Rosewood in two kinds of wooden box.